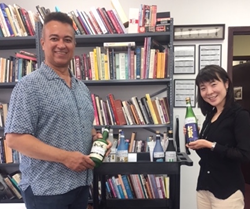 Renowned tasting experts came together at Tastings.com's offices in Chicago this June to blind taste and rate Sake, awarding only the best quality in each category. This year featured 15 Gold Medal winners, a truly great year for quality Sake! Tastings.com is the most prestigious and trusted authority in the alcohol beverage industry providing over 100,000 blind tasted reviews for over 37 years, including Sake, Wine, Beer, Cider, Mead, and Spirits. The 2017 World Sake Challenge featured 4 judges on 3 panels. The judges included; Julia Momose, star bartender at two-Michelin-starred restaurant Oriole, Peter Kim, bar manager for The Franklin Room, and Mariko Kallister, certified Sake sommelier and Sake professional trained at National Research Institute of Brewing in Japan. Joining the panels was the esteemed director of Tastings.com and moderator for Sake, Jerald O'Kennard. To learn more about the panels and how they taste and rate Sakes visit the judge page. "This years's sake review included a broad range of styles from everyday Futsu to esoteric Kimoto sakes—including some rarely seen competition-designated marques. The blind tasting panels were particularly impressed with quality of the Honjozo expressions." said Jerald O'Kennard, Director of Tastings.com. Honjozo sakes are made with the addition of distilled neutral alcohol, and are sometimes considered not as prestigious as Junmai expressions, which do not contain distilled alcohol. However, the panels confirmed that notion is completely outdated and untrue as several of the highest scoring brands were Honjozos! "All in all, the 2017 World Sake Challenge proved to be a magnificent year to be a sake enthusiast with great tasting sake styles out there for every taste and budget," said O'Kennard. Use Tastings.com as your buying guide before you purchase the next bottle of Sake. View all the Sake reviews here! Since 1981, Tastings has created over 100,000 reviews online for wine, spirits, and beer to help consumers buy and try quality brands. Tastings.com’s foundation is a professional blind tasting and review. They experience products by taste, sight, smell and touch. Highly organized beverage tastings are conducted in its Chicago offices and tasting lab to control any external factors and maximize judges' concentration. Every month, Tastings.com features a new category of alcohol reviews with special focus on top rated, Best Buy, and new products. This ongoing review creates fresh content that consumers love to engage with and provides sales and marketing support for beverage brands. Enjoying over 37 years of success and community in the drinks market, find out more about Tastings.com. If you are a member of the beverage industry, see how to get a Sake and other beverages reviewed here. View the entire list of 2017 Sake award winners!